Meet Bimini the Xia Xia hermit crab who like dance sing and play with friends. Bimini is very energetic and artistic girl crab who loves to come up with new games and entertainments. Her best friend is Turks, together they like to go shopping, watch cartoon on TV, dance, sing and arrange parties. Bimini's favorite color is purple, it's a color of her body and native shell. 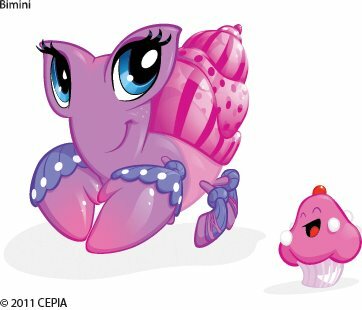 She has big beautiful eyes and little friend cupcake who likes to ride on top of her shell and suggest to Bimini various useful ideas. It's lots of dun in Xia Xia world everyday, join, collect, trade and connect!